replacement in Mexico could be a particularly beneficial option. Dental vacations in Mexico have become very popular with many Americans who are tired of paying higher prices at home, and people from San Diego, Yuma, El Paso, and other close-to-the border cities have found a convenient dental destination in Los Algodones or Tijuana. In a 2011 report entitled “Survey of Dental Care Affordability and Accessibility” conducted by Empirica Research, it was revealed that the number one reason Americans avoid dental care is the high cost. Talking about the benefits of receiving dental care in Mexico, one of the biggest advantages to consider and understand is the value in savings. Replacement of full arch teeth in Mexico can be availed for a fraction of the price you would be expected to pay in the US or Canada. You need not worry about having dental insurance or putting yourself into an overwhelming debt to have the procedure you need. By saving money on your dental procedure, you can easily extend your trip into a vacation. Having dental work in Cancun is a great way to get the care you need while visiting a beautiful, exciting tourist city. Complete arch replacement teeth in Mexico are not the only area you can save money in. If your dentist prescribes you medication to take after your procedure, you’d be able to make more savings in Mexico, where pharmacy prices are much lower. The affordability of care in Mexico doesn’t mean you’ll have to settle for lesser quality. Many people travel for root canals, dental veneers, crowns and bridges, and all-on-4 implants in Cancun, Tijuana, Puerto Vallarta and other cities of Mexico, and have reportedly returned very satisfied. Another great draw for many people deciding to have dental work done in Mexico is how easy it is to travel and receive care. Mexican cities like Los Algodones and Tijuana are well known for their dental facilities and are within a day’s car ride of several US Border States like California, Texas, and Arizona. Dental clinics in Mexico often have very short wait lists or none at all. Opting for same day dental implants in Mexico, many people travel to Mexico and back home very quickly. The close proximity of these cities means that you can get your fixed complete dentures in Mexico without ever feeling far from the comforts of home. Mexico offers many of the same conveniences you might find in the US, from popular chain restaurants to US clothing stores. A visit to the dental office is almost always accompanied by some stress. However, the stress of getting a replacement of all upper/lower teeth in Mexico can be countered by the leisure time you get to spend amidst the scenic beauty of some of its beautiful cities. If you have decided on getting full arch implants in Mexico, you can take time out to explore what the destination has to offer. If you choose to go to Cancun, you may enjoy relaxing on the white sand beaches and even visit some of the local nature parks like Xcaret or hidden Worlds Cenote Adventure Park, which feature flora and fauna that you won’t see anywhere outside of Mexico. If you’re considering traveling to Puerto Vallarta for dental care, you can enjoy the beautiful Vallarta Botanical Gardens, or take an exciting whale watching tour. If you’ll be traveling to Tijuana, you can consider watching Mexico’s famed bullfights in the bull ring open throughout the summer months. Whether you are in Cancun, Ciudad Juarez, or Mexicali, you know shopping in Mexico would always be cheaper than that at home. Take this opportunity to and find unique, interesting items, if you have some extra time on hand. Day trips across the border for dental implants, rcts, dental bridges, and dental crowns in Los Algodones are popular for their convenience as the town—with mushrooming dental clinics—is only a short drive from the border. Full arch teeth replacement in Mexico provides you an opportunity to experience a unique culture while receiving dental care. 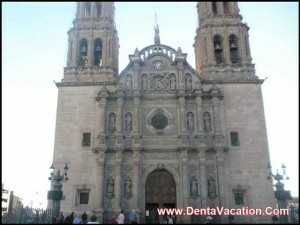 DentaVacation facilitates full-arch teeth restoration in Mexico at affordable prices. Fill-out the estimate request form on the right for more information.